On my last morning in Glacier, I had to leave fairly early, because I had to drive 566 miles to The Dalles on the banks of Columbia River in Oregon. So I awoke before five and, in the dark, took down the tent and packed up. Then I made the short drive (quarter of a mile?) 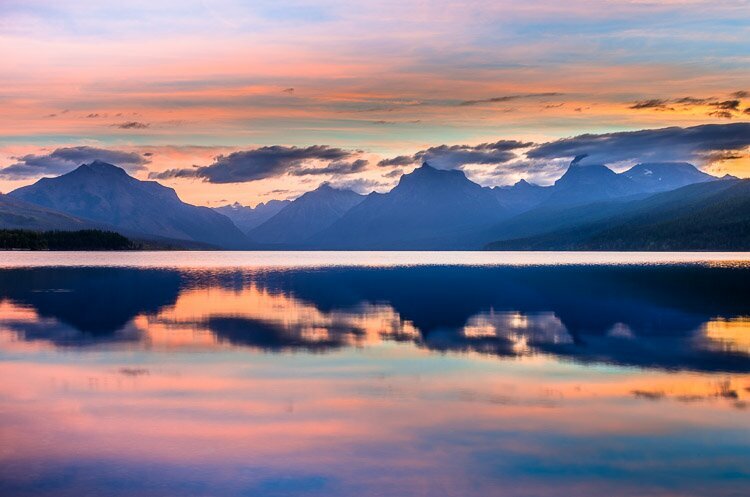 to Apgar beach to photograph the sunrise over Lake McDonald. That time of year, in September, the sun rises south of the main peaks that arise on the other end of the lake. I wasn’t going to photograph the sun rising. I was going to be photographing what was going on just to the left (north) of the sun rising. After the quick morning shoot, it was time to head west, leaving the very way I came: through the western entrance into the park.